Welcome to a magical world of spectacular adventure! 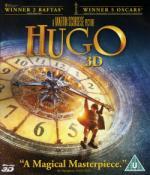 When wily and resouceful Hugo discovers a secret left by his father, he unlocks a mystery and embarks on a quest that will transform those around him and lead to a safe and loving place he can call home. Academy Award®-winning* filmmaker Martin Scorsese invites you to experience a thrilling journey that critics are calling "the stuff that dreams are made of"
I really enjoyed this film and thought that the transfer from the written page worked very well. The only problem I had was with the Station Inspector played by Sacha Baron Cohen. Mr Cohen played this man like a bumbling fool speaking in franglais as per the RAF pilot employed as a gendarme in the BBC TV series 'allo 'allo. All the other characters spoke normally why did the inspector have to idiotised. Rating: would have been a but for that mentioned above. Interesting. I liked his character and welcomed that change, but I can't stomach the girl in this version. Chloe Moretz was wrong for the role and they changed her character anyway, in small but vital ways. Unforgivable. 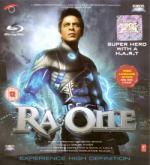 after Shekhar's body and car had been recovered from the river did the police not see the damage caused by Ra.One nor did anyone go to his lab to check that out or check with Akashi, I'll give them the doubt on Akashi as Ra.One had assumed his identity. You seemed to have enjoyed the movie more than I did. I couldn't remember much of how the characters developed in the book so didn't really pick up on the changes to Isabelle and Hugo but after reading your review I can see where you came from. But the portrayal of the Station Inspector as the 'allo 'allo gendarme was too much for me. I realise that Mr Scorsese must have been happy with it but it grated on me. yep seems that way. I found it fun and enjoyable, but then again it has been shown here, when you compare some reviews, that action and science-fiction films I tend to really enjoy more than other people. I went to see Wrath of the Titans today and enjoyed that. I can certainly understand why. The guy is Marmite at the bet of times. I expected to dislike him, but I saw something genuine in his character. Arguably the defining cult film of the Reagan era, the feature debut of Alex Cox (Sid & Nancy, Walker, Straight to Hell) is a genre-busting mash-up of atomic-age science fiction, post-punk anarchism, and conspiracy paranoia, all shot through with heavy doses of deadpan humour and offbeat philosophy. 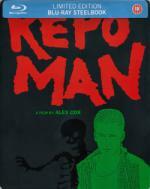 With an iconic soundtrack (Iggy Pop, Black Flag, Suicidal Tendencies), stunning Robby Müller cinematography, and iconoclastic direction, Repo Man remains one of the great debuts of the 1980s. The Masters of Cinema Series is proud to present a definitive Steelbook edition of the director-approved Blu-ray. A strange film with a chequered history. Overall I enjoyed it and I think that this was the first time I saw the film that Alex Cox made as opposed to the alternate TV version that usually gets broadcast. Kabir has just met Natasha. 6 months later they are engaged. He wants to go on an extended bachelor party. A 3 week road trip with Imraan and Arjun- his 2 best friends since school. 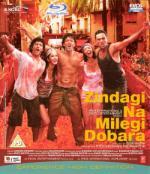 The only problem is Imraan and Arjun don’t speak to each other anymore. After much emotional blackmail and cajoling the boys set off on a journey they were meant to take 4 years ago. A fantasy holiday they had planned to take after college but never happened. A road trip where each one gets to do the ultimate sport of his choice and the other 2 just have to do it with him. Whether they want to or not! Kabir, Imraan and Arjun meet up in Barcelona and set off on an adventure that will not only make them face their fear but will alter their perception, unravel their fabric, force them to break out of the box and teach them to sieze the day. In other words a holiday that will change their lives forever. A fun road-trip film. Three slightly disparate friends from school days had drifted apart but come together to celebrate a forthcoming marriage and to create an adventure they had promised themselves. Although there were songs and poems in this film there were no full blown song and dance numbers. A nit-picking point is a scene set in London where you see a Routemaster bus in the background, Routemasters were taken out of service in 2005. Although I can understand them using this as they were an icon that represented London. KATE BECKINSALE returns as the ultimate vampire warrioress Selene in Underworld: Awakening, the stunning new installment of the epic saga for the first time in 3D. Having escaped years of imprisonment, she finds herself in a changed world where humans have discovered the existence of both Vampire and Lycan clans and are conducting an all-out war to eradicate both immortal species. Now Selene must battle the humans and a frightening new breed of super Lycans to ensure the death dealers' survival. An enjoyable film. The series is moving forward and this film sets up ready for the next installment. NICOLAS CAGE (Drive Angry, Season Of The Witch) stars as legendary action hero Johnny Blaze in one of the year's most thrilling, adrenaline-pumped films. Struggling to live with his flame-headed alter ego The Ghost Rider, Blaze is offered the chance to rid himself of his curse forever - but to do so he must defeat The Devil in a terrifying battle for survival. Co-starring Idris Elba (Thor) and Ciaran Hinds (The Woman In Black) and featuring ground-breaking special effects, Ghost Rider: Spirit of Vengeance is one hell of a ride. however I don't know if that is canon for the comic stories or whether it was just for this film. 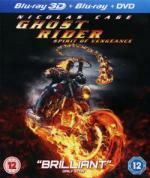 One biggish change between this film and the first is that the bike is no longer a chopper, although still special in The Ghost Rider's hands it is now a super-duper motorbike. 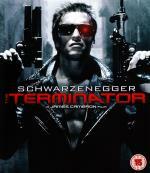 Arnold Schwarzenegger stars as the most fierce and relentless killing machine ever to threaten the survival of mankind! An indestructible cyborg — a Terminator (Schwarzenegger) — is sent back in time to kill Sarah Connor (Linda Hamilton), the woman whose unborn son will become humanity's only hope in a future war against machines. This legendary sci-fi thriller from pioneering writer/director James Cameron, and co-written by Gale Anne Hurd, fires an arsenal of action and heart-stopping suspense that never lets up! Have you seen the Ultimate Edition DVD transfer, Dave? I found it to be excellent. I have several of those releases and they seem to be good enough to not need Blu-Ray upgrade consideration. Yeah, I had that too, but the UE was a noticeable improvement. 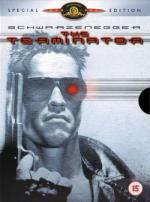 Not least because my original Terminator was the only title I had that suffered from "DVD rot" and wouldn't play!